"Ah, this is what it's all about!" Canyon Creek is a popular place, drawing backpackers from far-flung lands. 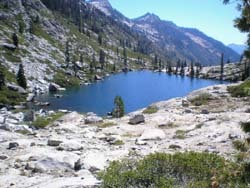 Into the granitic heart of the Trinity Alps, the trail rises due north 2600 feet in nine miles. Separately and together Barbara and I had visited there a half-dozen times in years gone by, beneath the hail and snow of uncertain Spring, within the stubborn heat of sun-blanched Summer, and amid the brittle leaves of Autumn. Our inclination has been to overlook this familiar gem in our own backyard. Why go back? Been there. Done that. We long instead to savor someplace new, unique, and mind-expanding, as our remaining hikes number toward zero. But backpacking up Canyon Creek is rarely a mistake. Particularly in the middle of a workweek, after Labor Day's bacchanal, when summer, exhaling, lies crisp and yellowing along the path of scattered leaves, oak and maple and madrone, just beginning to fall. The days have not yet surrendered to the preponderance of night. Early September proffers a final chance at salvation before the wheel turns and darkness falls. The Canyon Creek trailhead lies but two hours from our back door. In the past we have driven there and begun our hike by mid-morning. This time, however, our vacation spanned Labor Day, so we decided to take a more leisurely approach, camp at the trailhead the first night, and allow the three-day-weekenders to spill out like swill from an overturned stone urn, before trekking in on Tuesday. On Monday we dawdled until mid-afternoon in Blue Lake before heading east on Highway 299. At Junction City we turned left and followed Canyon Creek Road north. The road was paved all the way to the trailhead. We had contemplated overnighting at the Ripstein Campground, just shy of the trailhead, but the primitive campground overflowed with baby diapers, beer cans, and garbage cast off by departed holiday revelers. So instead we camped in the van at the trailhead (N 40 53' 14.9", W 123 01' 27.7"). Eight empty vehicles snuggled like suckling piglets against the center island of the large asphalt parking loop, which sported a tidy pit toilet. No one else was around. We snapped open our chairs beside the van and ate our deli sandwiches. At an elevation of 3080 feet, the summer evening was still warm and sultry, and before retiring we waited for the clockwork breeze to shift down canyon from the snowfields of Mount Hilton and Thompson Peak. Once the night air cooled, we would sleep fine. As we were preparing to climb into the van after night fell, a lone Subaru Outback slashed the darkness with its blinding headlights and parked directly across from us. We could just make out a single slight figure feeding a large dog from a metal bowl by flashlight, then sequestering itself in the front seat for the night. Tuesday morning we arose with first light. So did our late-arriving neighbor, who turned out to be a young woman bound with her dog for Alpine Lake. 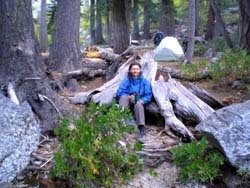 She planned to climb the steep, unmaintained Bear Creek Trail 3300 feet to the ridge crest, drop 2100 feet to the Alpine Lake Trail, then climb another 1900 feet to Alpine Lake to spend a single night, returning the following day. I wondered if she had any idea what a brutal route she had chosen, but not wishing to patronize, I did not ask. As we rinsed our oatmeal bowls, she and her dog disappeared into the forest. I shall ever wonder how they fared. We were on the trail by 9:15. The air was crisp, perfect for hiking up the relentless lower canyon. The steep eastern slope would block the morning sunlight. Light rain was forecast until 11:00 that morning, so we kept our ponchos handy, but all we saw were a few passing clouds. As soon as we left the parking area, the trail hooked into the Bear Creek Canyon to meet that creek at a rocky ford. Grimly we recalled this crossing from an earlier trip in June of 1999, eighteen months before my hip replacement. We had changed into our water shoes and waded across the creek, raging with Spring snow melt. Two days later and five miles further up, we had been caught in a thunderstorm, hail, and snow. Torrential rain drenched us as we cut our backpack short and hightailed it out. When we arrived at this crossing, Bear Creek had risen a foot to trap us. No longer was it safe to wade the roiling waters. We scrambled two hundred feet further up the brushy, muddy creek bank, unbuckled our waste belts and sternum straps lest, tumbling, the dead weight of our packs might pin us beneath the torrent, and crossed on a slippery wet log fallen across the churning cascade in perhaps the most dangerous maneuver of our entire backpacking career. This time we kept our boots laced and rock-hopped across the low water. For the next two-and-a-half miles the trail rose through interminable mixed forest as it gained a gradual thousand feet along the eastern slope of the Canyon Creek valley. For the most part the path rose arrow-straight, scratched into the steep embankment high above the creek, a dry lateral moraine shaded by incense cedar, scrub oak, and madrone, and punctuated with massive boulders fallen from the spiny metasedimentary crest above. But occasionally it would wind into a moist flat of towering Douglas fir, veer deep into a rocky cut where water trickled down the mossy bank, or follow the rocky bank beside the creek. Oak leaves, brittle and yellow, had already begun to clutter the wide, shady trail. We kept a sharp eye out for poison oak, but encountered little beneath the forest canopy. A group of day hikers, unburdened by backpacks, overtook and breezed past us, as did a pride of sweat-glistened young men with fishing rods whiskering from their backpacks. A couple passed us on their way out. For all but a few brazen rock climbers, Canyon Creek is a dead end. We tried to keep a tally, beginning with the cars we counted in the parking lot, of the backpackers who would be sharing the wilderness with us that night. Our estimate was fewer than we had expected. Three miles from the trailhead we arrived at the signed cutoff trail dropping left to a place intriguingly named "The Sinks." Reputedly, at low water the river disappears into the rock and boulders tumbled from the cliffs high above. Neither of us had ever been there, nor did we intend to explore a region below 4500 feet in poison oak country. At the junction we took the right-hand fork, and abruptly the trail grew serious as it began to climb out of the lower canyon in a series of switchbacks scaling the talus of the steep eastern wall of the canyon, thrice crossing a tinkling stream spangled with monkey flowers, delphinium, and columbine, through loose scree, scrub, and manzanita, toward the bedrock of the upper canyon. Bright patches of poison oak sunned themselves among the rocks on the bone-dry bank, reaching malignant tendrils into the trail. Afraid to stop, we plodded on despite the relentless slope. As if awakening from a long dream, our path at last surmounted the glacial till and scree to emerge onto the spectacular granite bedrock of the upper canyon. Almost inadvertently we had arrived at the lower falls. At 4443 feet, we had already hiked four miles and climbed 1400 feet. From the rounded granite crest we gazed back down the forestchoked lower canyon and ahead to the white pinnacles above. Ah, this is what it's all about! Hidden beside the creek beyond a glacier-smoothed granite dome was a fine campsite (N 40 55' 58.1", W 123 01' 19.4") where we had spent our first night in 1999. This was as far as my arthritic hip had allowed me to go. I recalled limping around camp in splintering pain, wondering if I could hike further. Wondering if I would be able to hike out. Here, some might argue, is where the paved road should end. Here, on the southern lip of the Canyon Creek Batholith, where the sharp metasedimentary schists give way to the spectacular white mesozoic granite of the upper canyon. Here should be built a vast parking lot, handicapped-accessible toilets, barbeque pits, and picnic tables, so that everyone, and not just the few elite who are physically fit enough for the four-mile hike, could enjoy the splendors of the upper canyon wilderness. Perhaps a Swiss chalet might provide postcards, diapers, and beer, and even turn a bit of profit. But that would be a mistake. If opened to those too lazy to abandon their cars, this place would soon become another Ripstein Campground. The wilderness would be slashed apart, graffitied, and buried beneath a tide of garbage. The ignorant, the superstitious, those bent on mindless proliferation, and their squealing spawn, would quickly swamp this immaculate preserve with the noise, effluent, and ugliness beneath which they are elsewhere cursed to drown. Someday Barbara and I will no longer be able to visit here. Fine. We can live with that. Just knowing that this place remains unspoiled will be enough. We have been very lucky to live at a time when these backpacks are still possible. We enjoy a closing chapter of a golden age. World population already exceeds six-and-a-half billion and grows like a toxic mold, an infestation that must ultimately sully these pristine wilds. Let us not hurry it along. At our old campsite we dropped our packs and ate lunch in the shade of a weeping spruce. Rare elsewhere, Brewer spruce grows abundantly in the upper canyon. After lunch, we had planned to scramble down the steep bank to a shaded pool below the falls, but a young couple with backpacks beat us to it. The falls were meager, a mere trickle compared to the torrent we had witnessed in the Spring of 1999. After lunch we pressed on. Upper Canyon Creek Meadow lay about a mile further, and we recalled an excellent campsite there. 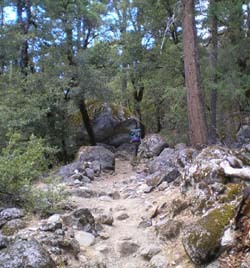 Trail crews had painstakingly rolled and levered the large granite rocks out of the way, and the trail now wound among them close beside the creek. Although the trail rose only another 200 feet, the hike became tiring in the full afternoon sun. About five miles from the trailhead, just shy of Upper Canyon Creek Meadow, lies a fire-blackened cave in a massive, cracked, cabin-sized boulder that once tumbled from the granitic cliff face far above. Squatting beside the trail, it is familiar to everyone who has taken this hike. The trail snakes between the cave and a fine campsite beside the creek. In 1999, we made it only this far on the second day. Not much of an advance, but pain in my hip from the relentless grinding down of my femur, bone on bone, would allow me to progress no further. Forewarned of possible drizzle that night, we had camped beside the familiar cave rock, roped up a rain tarp, and built our campfire in the cave. A bad idea. Smoke circled inside like a whistle and refused to vent. How our forefathers survived the epoch of cave dwelling is hard to reckon. They must have had no better choice and were eaten by predators long before succumbing to lung cancer. We propped our packs at the empty creekside campsite and set off to explore. Friends had told us of a secluded campsite at the end of a spur trail along the southern margin of the meadow. We found the camp, and it was indeed secluded. It was also rife with horse manure, underdeveloped, and without a view. It might make a fine hidden sojourn on those teeming holiday weekends when a plethora of tents sprout like colorful hot air balloons throughout the meadow and along the creek. But this time, no one else was around. So we returned to the creekside campsite (N 40 56' 22.7", W 123 01' 05.6"). In truth, it is one of the most pleasant spots to camp anywhere, protected by tall forest, with views of surrounding peaks and spires and comfortable rocks to lean against beside the flowing water. Brewer's Spruce and scrawny scrub maples with leaves just beginning to yellow around the edges decorated our new camp. 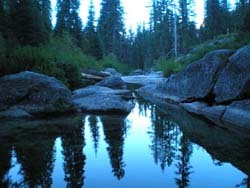 The once-roaring creek was subdued, forming peaceful blue pools in the wide places where it flowed through the rounded bedrock. 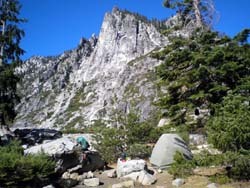 From our tent site, screened by boulders, we saw and heard only one or two passing hikers, and no one invaded our space. That night the temperature dropped to 40 degrees, but we slept warm in our down bags. Wednesday morning we heated water on a small wood fire and drank our tea and mocha leaning against smooth boulders beside the water. We dawdled, we waited for the sun to warm us, we enjoyed the stream and the tranquility of the camp. A short way upriver, a great blue heron stalked fish in a pool near our water-collecting site. We would see him again. With less than a thousand feet left to climb in three miles, we expected our second day to be a breeze. It would not be so easy. We finally packed up and were on the trail by 11 a.m., following the creek as it wound up the glacial till, from flowing water to impenetrable manzanita, from shady forest glade to exposed granite bedrock, all studded with massive fallen boulders. In a mile we came to a headwall down which tumbled the middle falls. The main trail veered right, away from Canyon Creek, to enter a forested wash of an intermittent creek, climbing through a shadowy spur valley in a series of long switchbacks dug into the duff. Hearing horsemen approach from behind, we stepped off the low side of the trail to let them pass. As they drew near, we recognized Dee Potter and a friend riding mules. Dee was the outfitter who had packed our group of six into Morris Meadow in late Summer of 2005. He was now retired from outfitting, but could not resist the long rides into the high country for a day. A joy it was to encounter an old friend in the wilderness. 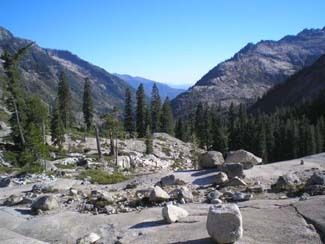 The trail crested the east flank of a granite dome and soon reached the trail junction to Boulder Creek Lakes. We dropped our packs and ate lunch, then explored along the Boulder Creek Lakes trail looking for a campsite favored by Mr. Popper. We did not find it. On the west flank of the dome, just before the creek tumbled down to become the middle falls, the trail began its long descent to a river crossing below, only to climb steeply on the other side toward Boulder Cree Lakes, a stark and beautiful alternative destination. We had been there before, but would not return this trip. 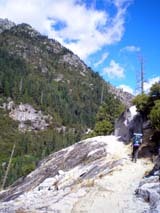 Back on the Canyon Creek trail, the climb became grueling as we continued up the blinding granite in the mid-day sun, through manzanita and sparse patches of timber. In time we arrived at the upper falls, where we took off our packs and rested at a splendid campsite shaded by Brewer's Spruce, Red Fir, White Bark Pine, and Mountain Hemlock (N 40 57' 41.0", W 123 01' 22.6", 5219 feet). Once, years ago, we had camped here for two nights, but the constant thunder of the falls had been disorienting. Muffled things seemed to slither and stalk behind us, while indecipherable voices called from the incessantcascade. But this time the falls were subdued, a meager flow down the face of the cliff. We continued up the bedrock, terrace after terrace like a giant's staircase, until the trail entered a stretch of level forest, then dropped to ford Canyon Creek at the base of the final cliff. The low water swirled among the boulders and allowed us to rock-hop across without wetting our shoes. We followed rock cairns up the slickrock bench until we crested the final ledge and beheld Lower Canyon Creek Lake and the high peaks beyond. In awe we stood perched on the doorstep of a granite cathedral, a natural tabernacle sculpted over incomprehensible time by the blind hands of fire and ice, an edifice perfect in its asymmetry, perfect in its imperfection, a monument toward which structures man-made aspire. Beside the vessel of holy water we set down our packs. We were all alone. In the past we had always camped in the forest below and day-hiked up to the lakes, a sound ecological strategy, but not entirely satisfying. This time we were determined to camp at the lake, and not simply pass through in a single afternoon. We would witness the mountain in all of its moods. Campsites were scarce and exposed, at best a level spot here or there on the rock or scraped in the sand among the silent boulders. Timber was sparse. Those few trees that managed a foothold in jagged cracks of the bedrock were carpeted by impenetrable manzanita, offering no shelter. Barbara waited with the backpacks while I explored further around the western shore. I found a wonderful campsite in the woods on a rocky promontory near the northwest corner, but the view north into the upper canyon was blocked by the headwall, and a climb down to the camp would have been formidable beneath full backpacks. So we opted instead for the open campsite where Barbara waited among massive boulders near the outlet at the south end of the lake (N 40 58' 09.9", W 123 01' 17.8"). 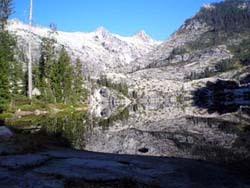 The view north was spectacular across the water and up the granite-walled canyon to Thompson Peak, the highest in the Trinity Alps. A permanent glacier is supposed to hunker beneath Thompson's south face. We had seen it before on every trip. But now it was gone. The mountain's white shoulders were granite. No snow could be seen anywhere. No wonder the creek was low and the water crossings so easy. From the glacier-polished ridge just above our camp vistas opened in all directions. Down the canyon, whence we had just come, the forested valley fled this stark, sublime rock in craven meanders toward a more hospitable landscape out of sight below. The altitude was only 5600 feet, but it felt like ten thousand. I decided to go for a swim to wash off the dust and sweat. As I crept down the slimy ledge into the water, both feet slipped, and I crashed flat on my back on the granite slab in the shallows. Barbara was alarmed, but except for my dignity, I was unhurt and paddled about in water warmer than I remembered. Between massive boulders we found a level place, and the packed sand afforded adequate purchase for our tent stakes. Shelter from the sun would be a big concern, but we were able to string our hammocks from stunted trees in the shade of a dwarf thicket of Brewer's Spruce, Red Fir, White Bark Pine, and Hemlock near the outlet stream. Further down we found a tree from which to hang our food bags for the night. 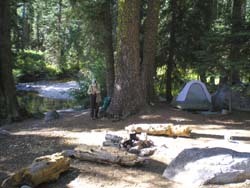 Campfires are not permitted in the high granite, where little firewood is available. We encountered an occasional small fire ring assembled by scofflaws, but we would not be among them. The propane stove we packed in would serve our needs. A few day-hikers arrived to fish, but kept their distance. Later, backpackers took sites in the trees on the way to the upper lake. It was windy on and off all evening, but warm. After the sun set, we lay on the warm granite slab for a long time staring up at the bright wash of Milky Way across the sky. We had not been in the tent long when I awoke to a clicking and clacking just beyond the thin fabric wall. Prancer and Vixen were dancing on a red tile roof. Surely those are just deer, I remember thinking, refusing to dwell on what else might be out there. They can't hurt anything. Before retiring, we had hoisted our backpacks atop five-foot-high boulders as protection against the wildlife. Ignore them. I rolled over in my down bag. Soon I awoke again to a different, more persistent sound. A scratching, slurping sound. I shook the wall of the tent, and it stopped, only to resume a few moments later. Was that the sound of chewing? Piqued, I lighted my headlamp, unzipped the door, and stuck out my head. A deer had climbed atop the boulder where I had stationed my backpack and was chewing the salt out of a shoulder strap. I scrambled out into the darkness and the deer scattered, but their eyes glowed in the periphery around me, waiting patiently. Were I to simply crawl back into the tent, they would resume their quest for salt. If they chewed through a strap, I would have one hell of a time toting out all my precious stuff. So I rousted Barbara and dug out the extra nylon line from my utility pouch. There, beneath the cold blazing stars and by the feeble light of our headlamps, we managed to hoist both backpacks a foot over our heads from the branch of a lonely Brewer Spruce. We did not wake up again until dawn, when a great horned owl began hooting nearby. Thursday morning we arose to the splendid isolation of the upper canyon, sat beside the still lake with tea and mocha, and watched the sunlight crawl down the faces of Thompson Peak and Wedding Cake. Unusual ducks paddled about on the water. They bore rusty top knots like kingfishers with long white beaks and gray backs with darker gray centrally. More dayhikers passed through from campsites below. One couple described the bears they had just seen, a mother and her cub, down across the outlet where we had hung our food. We looked for them in the brush and scrub of the canyon wall, but saw nothing. Once the sun crept over the canyon wall below Sawtooth Mountain, we ate breakfast in our hammocks. The small grove of trees would provide ample shade for most of the day. We hung our food, put our camp in order, and day-hiked the additional mile up to Upper Canyon Creek Lake. The rough trail was scored into the granite cliff and glacial till a quarter mile to the west of our camp. As we climbed steeply up a dry stream bed into the higher canyon, the landscape grew ever more rugged, sparse, and sterile. When we arrived at the upper lake, we found ourselves eerily alone. Across the placid water to the north, a sheer rock face rose vertically from the deep water, like the wall where a scoop had been dipped out of a fresh tub of ice cream, and indeed, that was what it was. Grain by grain, rock by rock, boulder by boulder, a glacier had borne down and meticulously scooped out the bowl which the upper lake now filled, depositing the excavated material as till and moraine further down the canyon. The time span was incomprehensible in human perspective, but in geological time had been short. An eye blink. A flash of lightning. Dew evaporating from the grass. At the northeast corner of the lake, where the rock face of the headwall had been ground down and eroded, the valley continued its ragged assent toward Thompson Peak. There, at the lake's inlet, lay a broad green sward. From there, an ambitious hiker could climb off-trail over the first ridge into a side canyon housing "L" Lake, so picturesque it had been chosen for the cover photo of the first edition of Luther Linkhart's popular hiking guide. Beyond Thompson Peak dead ahead would be Grizzly Lake at the head of the North Fork of the Trinity River. On the far side of an almost insurmountable ridge to the northeast lay Sapphire and Emerald Lakes, which we had visited in 2006 at the end of our long trek up the Stuart's Fork of the Trinity River. Over a high ridge on the west, unseen in its own rocky cirque, lay Papoose Lake.I had once hiked from there to the ridge crest and gazed down on these Canyon Creek Lakes from the broad granite rooftop. Behind us to the southeast rose the bulk of Sawtooth Mountain. We swam from the granite slabs that eased conveniently into the water at the lip of the dry overflow outlet up which we had hiked. The water should have been colder, but we were not complaining. Then we explored the granite dike above the south shore. A web of trails through sparse manzanita connected a few meager campsites and steep scrambles down the ledge to the water. No one was camped there. From the empty campsites we could look down on Lower Canyon Creek Lake. Through the binoculars Barbara spotted several people resting in a camp at the edge of the meadow on the other side of the lake. To get to the meadow, we would have had to climb down a scramble of loose rock into the lake's narrow outlet gorge at the southeast corner, carved deep into the bedrock by rushing water. A few scrawny trees clung to the rocky bottom. But age had attenuated our ambition and our abilities, so we turned back. The dike was treeless and exposed. Blazing sunlight reflected doubly from the sea of sparkling granite. We grew desperate to find shelter and eat lunch, and ended up climbing onto a north-facing ledge where the rock and overhanging manzanita offered a little shade. Two dayhikers arrived and swam from the granite far below us. That long afternoon we spent drinking in the harsh beauty of the glacier-sculptured rock. And then it was time to begin our retreat. 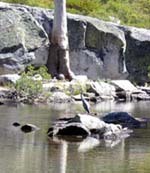 When we returned to camp, a great blue heron fished in the shallow water near the outlet. Barbara thought it was the same bird we had seen fishing at our first night's camp. We swam for a while, then rested in the shady hammocks as time nibbled away our last afternoon at the lake. From the hammocks we saw a hawk or falcon with white underside, dark top, and white tail band. A water ouzel dipped at the outlet. As we lay in bed that night, our friend the great horned owl serenaded us, this time alternating calls with an unseen mate. Friday morning we broke camp and began our hike out a little after 10:00 o'clock. The atmosphere down the canyon to the south was hazy, perhaps smokey. We wondered if a new forest fire was burning. 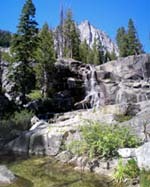 Views into the Boulder Creek Lakes Basin and up to Mount Hilton opened as we descended the granite dike impounding the lower lake, crossed the creek, and passed the campsite at the upper falls. We met a ranger hiking in to photograph damage done by horse packers near the outlet of the upper lake. A number of trees has been cut down. We had not noticed them. He shook his head. Last year, he told us, there were 17 rangers patrolling the canyon. Now, because of budget cuts, they were down to one. We hiked past the trail junction with Boulder Creek Lakes, and the trail dropped down the granite dome and reentered the mixed forest. As we followed along the creek, the day grew hot, so we began looking for a campsite for the night. We explored one or two, but each lacked an amenity or two. At one the water access was difficult, at another no fire ring, and a third was brushy and too close to the trail. Finally at 5047 feet elevation we found a clean campsite with good water access .7 miles by GPS above the Cave Rock (N 40 57' 01.0", W 123 01' 08.2"). By 2:00 in the afternoon it was already 75 degrees on the trail, but cooler down along the creek in the shade of willow, alder, and cottonwood. As we set up our tent, Barbara spotted a great blue heron flying south down the creek. Was this the same heron? Two small deer watched us from the brush, so we again hung our backpacks as well as our food. In the evening, we again heard a great horned owl. Saturday we hiked out the final six miles beneath an increasingly smokey sky. (We later learned that new forest fires were pumping smoke into the Trinity River Valley, a big one in the Plumas National Forest to the south, and three closer ones in the Yolla Bollys and near Weitchpec and Klamath.) A backpacker we met on the trail said the Sinks were the lowest water flow she's ever seen, "just a small pond." Another backpacker we encountered told us he had slept in his truck in the parking lot the night before, and a bear waddled through thumping on the vehicles. He turned on the engine and lights and scared it away. Fallen leaves of maple, oak, and madrone reappeared as we retraced our footsteps down the dry tunnel of mixed forest on the steep slope far above the creek. Tiny gnats buzzed around our heads. Once, twenty-five or thirty years earlier, I had hiked all the way to the Lower Lake, swam in the numbing cold water, and trudged back out in a single day. At the end of the 16-mile trek the soles of my feet burned, and this last stretch felt like it would never end. But just when all hope seemed lost, the trail veered left into the Bear Creek canyon and dropped to cross the creek. In another quarter mile we were at the parking lot. The van was unscathed by marauding midnight bears.